One of my favorite fashion street style blogs is Jak & Jil and while I was perusing the site the other day I came across two photos that I absolutely love and had to share them with you. Both images are taken by Tommy Ton of Jak & Jil. I need everything in the second photo. All of it!! Rihanna was spotted wearing a vintage Chanel-print satin bomber jacket at Coachella this weekend – love this jacket!! I’ve never seen it in pink! Heritage Auctions has launched its Spring Luxury Auction, a bi-annual major luxury auction, online and bidding is now open. The actual auction will take place on August 29th in New York. Here’s a sampling of the gorgeous Chanel pieces – including a very rare Chanel bicycle! You can see all the pieces and bid online on the Heritage Auctions website. Stylist and Vintage Archivist: Liz Baca, The Goods! Last week I was in Las Vegas attending PROJECT trade show and was able to photograph some ladies wearing Chanel. Being Las Vegas there were definitely many ladies wearing Chanel but the camera wasn’t out and ready at the moment so there were many missed opportunities. Here are some goodies for you…. Here are some other great bags – since I take the photos quickly I can’t verify authenticity – but these sure look good! 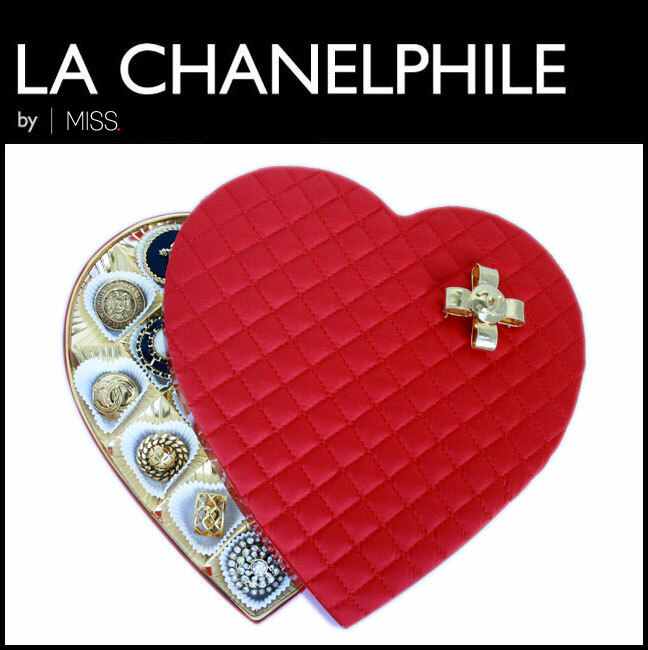 Sending lots of love, chocolate and hopefully Chanel your way! Have a great day! Styling and Jewelry Provided By: Liz Baca, The Goods! Rihanna hit the streets with blonde new locks and wearing a vintage Chanel leather cap. Not sure the exact year of the hat but it definitely looks like 80s or early 90s. I’m loving it – what do you think? A few months ago my good friend Liz Baca/The Goods!, a vintage dealer, sold some of her vintage goodies at the Manhattan Vintage Clothing Show. I knew there would be lots of Chanel floating around so I asked her to take some Chanel street style shots for me to feature on the site. Here is the best of the Manhattan Vintage Clothing Show – all photos by Liz Baca on the iPhone.